When I began work­ing as, and think­ing of myself as, a graph­ic design­er, I assumed that all of my ideas would have to spring out of my mind … and that was ter­ri­fy­ing. (Think of the oft-asked ques­tion, “Where do your ideas come from?”) I didn’t think I was cre­ative enough or wide­ly trav­eled enough or even edu­cat­ed enough as a graph­ic design­er to come up with ideas that would trans­late into smart, pleas­ing designs on paper or a com­put­er screen. Then I talked and worked with oth­er graph­ic design­ers. I learned that they had fold­ers full of “ref­er­ence mate­r­i­al,” designs they admired, cut out of mag­a­zines and news­pa­pers, along with pho­tos they’d tak­en and words type­set in inno­v­a­tive ways. And that sound­ed liked cheat­ing to me. Were they just copy­ing oth­er people’s designs? I began col­lect­ing my own ref­er­ence mate­ri­als (books, mag­a­zine pages, type, col­or swatch­es) and orga­niz­ing them into fold­ers and note­books. As I became more expe­ri­enced, I under­stood that look­ing at ref­er­ence mate­ri­als was not copy­ing because some­where dur­ing the cre­ative process my brain added its own con­cepts and my design sel­dom looked any­thing like the ref­er­ences I had used for a project. So many young peo­ple are inter­est­ed in cre­at­ing their own comics and graph­ic nov­els. They have sto­ries to tell and they want to do it in a visu­al way. There’s a learn­ing curve. They’ve prob­a­bly read enough “ref­er­ence mate­ri­als” when they begin, enough that they intu­itive­ly under­stand sequence, the gaps in time and sto­ry, and the con­ven­tions of dia­logue bub­bles and frames. They may begin by copy­ing their favorites, but what they’ve read informs their sto­ry­telling and what they cre­ate will be entire­ly their own. How refresh­ing to have Leonard Mar­cus’ book of inter­views, Comics Con­fi­den­tial: Thir­teen Graph­ic Nov­el­ists Talk Sto­ry, Craft, and Life Out­side the Box (Can­dlewick Press). It’s a ref­er­ence mate­r­i­al of a com­plete­ly dif­fer­ent type, invalu­able real­ly, because it shares how these thir­teen much-admired artists tell their own sto­ries. We get a peek into their lives, their expe­ri­ences, their notions of art and the work they’ve done before they achieved their much-admired sta­tus. Every inter­view, whether I know the work of the artist or not, held me riv­et­ed to their sto­ry, their expe­ri­ences, their gain­ing of knowl­edge. I loved read­ing that many of them worked with a group of like-mind­ed comics artists, learn­ing and devel­op­ing togeth­er. These inter­views instill con­fi­dence and sure­foot­ed­ness. As a young and bud­ding sto­ry­teller, I know that tid­bits from these biogra­phies would change how I work and how I think about my images and scripts. What you see clear­ly in your mind fre­quent­ly doesn’t trans­late well into your draw­ing or screen. You have to do a lot of eras­ing. Much as the con­cept of revi­sion is taught by edu­ca­tors in thou­sands of class­rooms, this idea of work­ing on the frames in a com­ic book page until they are telling the best sto­ry pos­si­ble, both in words and pic­tures, can be enor­mous­ly free­ing and encour­ag­ing. In this book, each inter­view sub­ject cre­at­ed an orig­i­nal two-page sto­ry. Both the fin­ished com­ic and an orig­i­nal sketch are shared. Mar­cus tells us in the cap­tion for the “Turf” sketch that Nov­gorod­off “not only spec­i­fied more back­ground detail but also moved more action to the fore­ground and turned more of her char­ac­ters to face us.” That’s essen­tial infor­ma­tion! Kazu Kibuishi, who keeps his fans breath­less with antic­i­pa­tion for the next vol­ume in the Amulet series. Hope Lar­son, astound­ing sto­ry reteller of Madeleine L’Engle’s A Wrin­kle in Time. Matt Phe­lan, who has graced us with excep­tion­al sto­ry­telling and art in books like Bluffton and The Storm in the Barn. James Sturm, the bril­liant sto­ry­teller and instruc­tor behind the Adven­tures in Car­toon­ing series. Sara Varon, well-loved for Odd Duck and Pres­i­dent Squid and Robot Dreams. Gene Luen Yang, whose Avatar, Shad­ow Hero, and Secret Coder series all show the bril­liance for which he was award­ed a MacArthur Genius Grant. These are just a few of the mighty tal­ents inter­viewed for Comics Con­fi­den­tial. Mar­cus, who is a mas­ter at ask­ing ques­tions that bring forth the infor­ma­tion Every Read­er wants to know, has cre­at­ed a book for­mat­ted beau­ti­ful­ly, brim­ming with ele­ments that read­ers will pore over, with a help­ful bib­li­og­ra­phy in the back mat­ter. If you’re an edu­ca­tor, this book will open your eyes to the skill and imag­i­na­tion and well­springs of cre­ativ­i­ty from which our very best graph­ic nov­el­ists for young read­ers draw (tired pun, but apt). 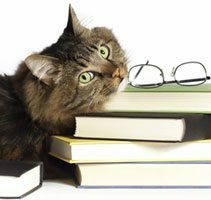 You’ll under­stand and appre­ci­ate graph­ic nov­els and com­ic books in a way you haven’t done before read­ing these inter­views. Your youngest bud­ding artists may have a hard time read­ing the book if their read­ing lev­el doesn’t match the book’s vocab­u­lary but Comics Con­fi­den­tial is also a pow­er­ful incen­tive to per­se­vere so you can learn from the mas­ters. If you have a small group of inter­est­ed comics cre­ators in your room, read­ing the inter­views out loud and dis­cussing them, par­tic­u­lar­ly with some of that artist’s books at hand to review, would inform those stu­dents … and make you look awful­ly smart. I have loved comics since I read my first Don­ald Duck com­ic book in the first decade of my life. I quick­ly became enam­ored of super­hero comics. I wasn’t allowed to buy them but thank­ful­ly my cousins were. I often spied one under a cof­fee table and took myself sur­rep­ti­tious­ly into a qui­et room to read it before we went home. As an adult, I con­tin­ue to love the visu­al nature of the sto­ries and the dif­fer­ent, inven­tive ways in which sto­ries are told by comics artists. Comics Con­fi­den­tial is a dream-come-true, allow­ing me to “meet” the visu­al sto­ry­tellers I admire great­ly. I con­sid­er this book an essen­tial pur­chase for every library and class­room. Grow­ing up in Malaysia and Sin­ga­pore, what were the pop­u­lar com­ic books? Well in terms of what you’d see at the news­stands , there was Old Mas­ter Q or Lao Fu Zhi from Hong Kong. In schools, there’d always be some­one read­ing Tin Tin, Aster­ix or Archie. Myself, I also read a lot of Beano, Richie Rich and, a bit lat­er on, Mad mag­a­zine. That last one prob­a­bly turned me into a life­long dis­si­dent. How old were you when you start­ed draw­ing or paint­ing? What were your fre­quent sub­jects? I think draw­ing comes very nat­u­ral­ly to kids, it’s just an instinct to pick an pen or cray­on and scrib­ble away. But I sup­pose I con­tin­ued draw­ing at an age when a lot of peo­ple stop—the ear­ly to mid-teens? By that stage I was very caught up with role-play­ing games like Dun­geon and Drag­ons and Drag­on War­riors, so a lot of it was fan­ta­sy art fea­tur­ing bar­bar­ians and elves. What deci­sions took you on your life path from Cam­bridge [Uni­ver­si­ty] to the Rhode Island School of Design? I start­ed doing a com­ic strip for a local Sin­ga­pore­an news­pa­per whilst I was still in Cam­bridge, and that whole process—thinking up ideas, finess­ing a punch line, draw­ing the final art—it just felt like some­thing I could be total­ly engaged with. So I was pret­ty sure I want­ed to do some­thing arts-relat­ed after grad­u­at­ing, though it took me a while longer to fig­ure out that I ought to go to art school, to learn every­thing from paint­ing to sculpt­ing, col­or the­o­ry and com­po­si­tion. At what point did you decide that you’d like to be a comics artist? Look­ing back at it now…I guess dis­cov­er­ing works by cre­ators like Chester Brown and Charles Burns—they opened up my mind to a dif­fer­ent kind of comics then what I’d been used to—complex, per­son­al sto­ries that took the medi­um to whole new places. I sup­pose I had a sense then that engag­ing with the medi­um could be a lifetime’s endeav­our. How does it work in the comics world…how did you get signed on to The Shad­ow Hero as the illus­tra­tor? Heh, I actu­al­ly think that’s the wrong term, “illus­tra­tor.” Comics is a com­bi­na­tion of text and images, there’s no real way to divide the two in the way the sto­ries are told. It’s more a case of sto­ry­telling as a whole, with the writ­ing and art­work being han­dled by dif­fer­ent peo­ple in some cas­es. It’s a minor detail maybe, but per­haps does have some sig­nif­i­cance in the way books are clas­si­fied or con­ceived in some places, espe­cial­ly those more used to prose nov­els, where illus­tra­tions are seen as sec­ondary, an add-on rather than an inte­gral part of the sto­ry. In any case…Gene and I had worked togeth­er on a short sto­ry for the Secret Iden­ti­ties anthol­o­gy a few years a back, and his sto­ry is that I was the first per­son he thought of when he had The Shad­ow Hero script ready. I’d like to believe that’s true! On my end, it was a no-brain­er to get the chance to work with Gene again on the project. The col­or palette you chose for The Shad­ow Hero goes from a fair­ly neu­tral gray and brown palette to vivid­ly intense reds, greens, and golds. How did you choose those col­ors? It’s usu­al­ly a mat­ter of tri­al and error, tweak­ing the palette until it looks right. 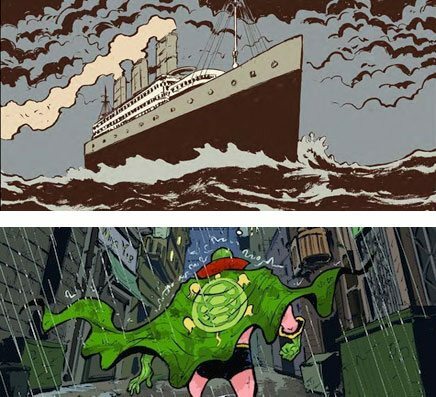 It’s always a func­tion of sto­ry­telling, and in the this case, we need­ed dif­fer­ent palettes to mark out the past from present, as well as a look that evoked the feel of the orig­i­nal Green Tur­tle comics. Did you con­fer with Gene Luen Yang while you were draw­ing the sto­ry? If so, did parts of the sto­ry change based on your dis­cus­sions? Only minor things like lay­outs, rather than any deep­er struc­tur­al or the­mat­ic con­cerns. Gene’s scripts are won­der­ful­ly clear-head­ed, and the changes I sug­gest­ed were most­ly to add a lev­el of visu­al dynamism where pos­si­ble. Or maybe just to jus­ti­fy my pres­ence on the project. Did you refer to Chu Hing’s Green Tur­tle comics when you were doing your sketch­es? For sure! I don’t own any phys­i­cal copies of the com­ic, but for­tu­nate­ly these days you have access to dig­i­tal ver­sions. Who was your favorite char­ac­ter to draw? Uncle Wun Too. There was a won­der­ful eccen­tric­i­ty about him, and I got to draw him in a cos­tume that paid homage to Old Mas­ter Q.
We’re look­ing for­ward to The Art of Char­lie Chan Hock Chye (Pan­theon, ear­ly 2016). What can you tell us about your work on that book? Son­ny Liew is a com­ic artist , painter and illus­tra­tor whose work includes titles for DC Ver­ti­go, Mar­vel Comics and Image Comics. He has received Eis­ner nom­i­na­tions for his art on Won­der­land (Dis­ney), as well as for spear­head­ing Liq­uid City (Image Comics), a mul­ti-vol­ume comics anthol­o­gy fea­tur­ing cre­ators from South­east Asia. For more infor­ma­tion please vis­it his blog. What qual­i­fies a comics char­ac­ter as a super­hero? You’ve asked a ques­tion that lies at the very heart of geek­dom. I don’t know if there’s a sol­id answer. Most super­heroes have super­hu­man abil­i­ties, but not all. Most super­heroes wear col­or­ful cos­tumes, but not all. Most super­heroes have goofy alias­es, but not all. Maybe a char­ac­ter just has to make her­self into a sym­bol of some­thing big­ger, some­thing more. 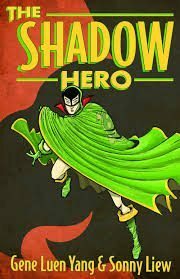 The Shad­ow Hero is an ori­gin story—you and artist Son­ny Liew cre­at­ed a back sto­ry for a char­ac­ter and series that had a brief, four-issue life back in the 1940s. You knew your end point: The Green Tur­tle would end up help­ing the Allies’ war effort dur­ing WWII, and because you want­ed to make the super­hero Asian, you had a start point. With those two points pinned on a board, what was the next step in writ­ing the sto­ry? Lots and lots of think­ing. I debat­ed how old the pro­tag­o­nist should be, where he should come from, who should be in his sup­port­ing cast. Hav­ing pre­de­ter­mined begin­ning and end points actu­al­ly made things eas­i­er. Often, I’m frozen by inde­ci­sion. Those “pinned” points nar­rowed my options, at least a lit­tle bit. I knew I want­ed the char­ac­ter to be of Chi­nese descent but raised in the West, like me. I researched the his­to­ry of the Chi­na­towns in San Fran­cis­co and New York, and found some good sto­ry fod­der. The pro­tag­o­nist, Hank, is con­tent to work at his father’s side in the fam­i­ly store when he’s thrust into extra­or­di­nary events. He’s not born with his super­pow­er and he nev­er dreamed of being a super­hero. Why did you choose to work with this dra­mat­ic path? Often, immi­grants’ kids are born into dreams. We’re born into a set of expec­ta­tions. I want­ed that to be a pri­ma­ry ten­sion of the book: Hank’s mom wants one thing for him, Hank him­self wants anoth­er. Super­heroes are deeply Amer­i­can. They were invent­ed in Amer­i­ca, they’re most pop­u­lar in Amer­i­ca, and at their best super­heroes express Amer­i­ca at its best. Hank’s mom sees “super­hero­ing” as a way of becom­ing Amer­i­can, a way to final­ly be accept­ed by her family’s new coun­try. Hank could care less, at least in the begin­ning. He just wants to be com­fort­able. You’ve stat­ed in inter­views that The Shad­ow Hero is about the immi­grant experience—about being the child of immi­grants, espe­cial­ly. Could you dis­cuss this for our read­ers, many of whom teach and oth­er­wise work with chil­dren of immi­grants? Almost every major super­hero was cre­at­ed by chil­dren of Jew­ish immi­grants: Super­man, Bat­man, Spi­der-Man, the Hulk, Cap­tain Amer­i­ca, Iron Man, the X-Men. Con­scious­ly or not, they embed­ded their life expe­ri­ence into their cre­ations. Immi­grants’ kids often grow up with one name at home and anoth­er at school, one set of expec­ta­tions at home and anoth­er at school. We nego­ti­ate between two iden­ti­ties. That’s a con­ven­tion in the super­hero genre. Super­man isn’t just Super­man, he’s also Clark Kent. Bat­man is also Bruce Wayne. Spi­der-man is also Peter Park­er. I some­times won­der if that’s why I loved super­heroes so much as a kid. I saw myself in them. Please say a bit more about the research involved in writ­ing about pre-WWII Chi­na­town and oth­er set­tings or ele­ments. I read about ear­ly Chi­nese com­mu­ni­ties in San Fran­cis­co, New York, and Hawaii. Iris Chang’s The Chi­nese in Amer­i­ca was par­tic­u­lar­ly help­ful. Have you ever made your own super­hero cos­tume? I haven’t, but my friends have on my behalf. For my bach­e­lor par­ty, they dressed me up as a char­ac­ter they called Wein­er Man –cape, under­wear on the out­side, an absurd and slight­ly inap­pro­pri­ate chest insignia. You are also a vet­er­an high school teacher. Your grad­u­ate-school work focused on the val­ue of comics as an edu­ca­tion­al tool, and you’ve list­ed on your blog some comics that are a per­fect fit for a S.T.E.M. cur­ricu­lum. On anoth­er site, Comics in Edu­ca­tion, you list pro­fes­sion­al resources to help teach­ers learn to inte­grate comics into the class­room. If you were to tell an uncon­vinced teacher the sin­gle­most rea­son to include graph­ic nov­els with­in the cur­ricu­lum, and not just as inde­pen­dent read­ing, what would that be? Sim­ply put, cer­tain types of infor­ma­tion are bet­ter com­mu­ni­cat­ed through pic­tures. I love words. I read words for fun and I read words for work. Words are incred­i­bly, incred­i­bly impor­tant to me and I nev­er want them to go away. But words can’t do every­thing. Can you imag­ine putting togeth­er a Lego set by fol­low­ing words-only instruc­tions? So many con­cepts can be bet­ter explained with pic­tures: osmo­sis, the bina­ry num­ber sys­tem, fac­tor­ing. I don’t see comics as a replace­ment for prose—I see comics as anoth­er tool in the tool­box. Teach­ing is such a dif­fi­cult pro­fes­sion. Shouldn’t teach­ers have access to as many dif­fer­ent tools as pos­si­ble? Your forth­com­ing Secret Coders, Book 1 (illus­trat­ed by Mike Holmes) will be pub­lished this fall by First Sec­ond Books. Could you briefly tell us about this book and the series it launch­es? I’m very, very excit­ed about Secret Coders. This is my first explic­it­ly edu­ca­tion­al graph­ic nov­el series. It’s also my youngest – it’s mid­dle grade. Secret Coders is a bit like Har­ry Pot­ter – our young pro­tag­o­nists find a secret school. How­ev­er, instead of teach­ing mag­ic, the secret school teach­es cod­ing. Mike and I hope that, as our char­ac­ters learn to code, our read­ers will too. A final ques­tion about The Shad­ow Hero: If you hopped into the way-back machine and land­ed in sev­enth grade and had to give a very short report on The Shad­ow Hero to your class­mates, what one thing about the book would you want to share with them? It’s got punch­ing in it! And mahjong! Gene Luen Yang is a comics writer and illus­tra­tor. His book Amer­i­can Born Chi­nese was the first graph­ic nov­el to be nom­i­nat­ed for a Nation­al Book Award and the first to win the Amer­i­can Library Association’s Printz Award. Box­ers & Saints, his two-vol­ume graph­ic nov­el about the Box­er Rebel­lion was nom­i­nat­ed for a Nation­al Book Award and won the L.A.Times Book Prize. His work has won two Eis­ner Awards. Gene has also done a num­ber of oth­er comics, includ­ing Dark Horse Comics’ con­tin­u­a­tion of the pop­u­lar Nick­elodeon car­toon Avatar: The Last Air­ben­der, and DC Comics’ Super­man. For more infor­ma­tion please vis­it his web­site.